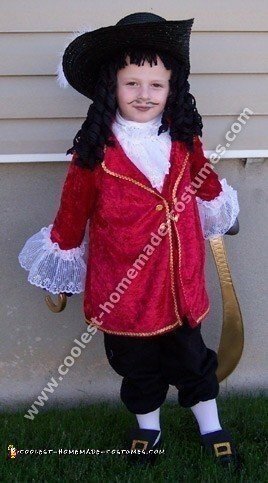 I have two boys now and thought it would be great to dress them in a Captain Hook and Peter Pan costume. After looking at store-bought costumes, and not liking the quality or the price tag, my Grandma and I decided to tackle it ourselves. For the costume we first started with an old boy’s blazer pattern (when I say old I mean old, this particular pattern only cost $0.15 when purchased) and we modified it slightly to make it longer. I then purchased a cheap turtleneck, and a pair of black sweatpants (we liked black better than Captain Hook’s red). The sweatpants we just pull up to the calves and bunched slightly over a pair of white tights. I bought a 4-inch wide lace (at a discount retail store) to use for trim on the cuffs, and for the ruffles on the shirt of the Captain Hook costume. I added some gold Rickrack to outline the jacket (this was really cheap, only a dollar for the entire jacket, and it really adds a lot!). Then put four gold buttons, just for looks on the jacket of the Captain Hook costume. My son and I love the movie Peter Pan, and I wanted to be as accurate as possible. All I could find for shoes was boot covers, so I got a little creative. He had an old pair of Penny Loafer-type church shoes that I fixed up with a sheet of self-adhesive craft foam, cut out the shape for shoes and attached to the shoes. I then cut out two buckles from the same foam and painted them with Glitter Glue (did the same for the belt buckle). The last big thing with this Captain Hook costume was the hat. My Grandma had a woven straw-type hat that we pinned one side to the middle, then got it wet and let it dry like that. We then spray painted it black (it was originally Green) and bought the white plume. I had looked high and low for a wig that I thought would work for the Captain Hook costume, but was unable to find anything. So I made my own by using black yarn, I took seven or so long strands of yarn at a time and dipped it in water and a white school glue mixture, then wrapped it around a fairly large dowel, and placed it in a 300 degree oven for a half hour to dry. After repeating this several times (could have made it a much shorter process by using more dowels.) I used hot glue to attach the ringlets to the hat, then made bangs using the same yarn. Voila! I am thrilled with how great this Captain Hook costume turned out, and especially happy with the price tag! Much cheaper than Disney’s version at $35 and much, much cuter!